Nigeria is the most populous country in Africa and the ninth most populous country in the world. The country has one of the highest population growth rates. The United Nations estimates Nigeria will contribute significantly to the total increase in the world’s population by 2050. The country is Africa’s major oil producer with the largest natural gas reserves in the continent, the sixth largest producer (and eighth largest exporter) of petroleum in the world, and has the tenth largest proven reserves. However, Nigeria faces several socioeconomic problems. Some of the most critical challenges to development in Nigeria are deeply entrenched poverty and unemployment, hunger, and burden of disease. Currently, Nigeria has over 186,988,000 people (UNdata, 2016) to feed. The population is growing, and an estimated 122 million people now live on less than US $1.25 per day. Nigeria accounts for 23% of arable land across all of West Africa with an arable land potential of 98 million hectares of which 84 million hectares are cultivatable. However, Nigeria’s agricultural potential is largely untapped with only 34 million hectares being cultivated. Nigeria’s health indicators remain among the poorest in the world. Nigeria has the second-largest number of people living with HIV globally and accounts for 9% of the global HIV burden. Millions of children have been orphaned and made vulnerable as a result of the HIV/AIDS epidemic. Nigeria continues to have the highest burden of malaria in the world, which remains a top cause of maternal and childhood illness and death. Nigeria is also besieged by violent conflict which has resulted in displacement and large-scale loss of life and property. The Boko Haram insurgency has resulted in a highly insecure environment in Northeastern Nigeria. 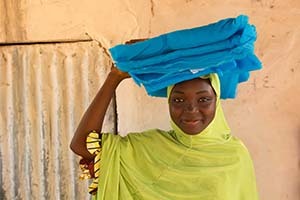 In north central Nigeria, land use disputes between pastoralists and herders have increasingly resulted in the death of community members. These and other conflicts have led to an increasing number of internally displaced persons (IDPs). At present, Nigeria has the highest number of IDPs in Africa with an estimated 2.1 million persons displaced in 13 states (OCHA 2016), many of whom live in host communities and/or informal satellite settlements. Immediate challenges include food security; water, sanitation and hygiene; shelter; health services; and psychosocial support for displaced people and the communities that host them. Attacks on health facilities in the Northeast have forced health workers to either flee or shut down clinics and hospitals. This has led to a shortage of capable healthcare workers, has limited availability of healthcare services and supplies, and has restricted communities’ access to healthcare facilities. These conflicts and displacements have also disrupted agricultural production and trade, significantly impacting livelihoods for rural communities who depend predominantly on agriculture for household nutrition and livelihoods. There are several far-reaching social consequences of violent conflict as well, including the deterioration of the social fabric of communities along with trauma and mistrust. Catholic Relief Services began working in Nigeria in the 1960s and was active during the 1967 civil war in the area of emergency response. After the war, the Nigerian Government asked CRS and other international development agencies to leave the country. Thirty years later, with the return of democracy after years of military rule, CRS returned to Nigeria in 2000 at the invitation of the Catholic Bishops Conference of Nigeria. CRS has a history of health programming in Nigeria that spans over ten years. In partnership with the Catholic Church, other faith-based and community-based organizations, and government institutions, CRS implements a range of complex programs with support from a variety of donors and private funds. CRS is working in 13 states within Nigeria to reach 77 million people to prevent and treat malaria. Reducing malaria in Nigeria will have a big impact in the overall fight to eliminate this disease. See how we’re doing it. CRS works in three priority sectors: agriculture and livelihoods, health, and emergency response and recovery. CRS supports households, communities and farmer groups to increase their agricultural production and diversify their incomes. CRS has also launched an impact investing initiative to strengthen social enterprises and bolster sustainable, responsible economic growth in the country and is developing a strategy to identify investments and support the impact investing ecosystem in Nigeria. In the health sector, CRS’ programs address HIV/AIDS, malaria, nutrition, routine immunization and polio eradication, and provide support to orphans and vulnerable children and their caregivers. In response to the Northeast emergency, CRS is providing access to life-saving food; shelter; and water, sanitation and hygiene resources and services for IDPs and conflict-affected host communities. CRS and partners work in 32 of the country's 36 states and the Federal Capital Territory with an extensive grassroots network and tremendous capacity to reach the rural poor. CRS has been a sub-recipient (SR) on the Global Fund’s HIV grant since July 2011, where it has achieved the highest performance rating among the National Agency for the Control of AIDS’ SRs for two terms running. In partnership with State Ministries of Health and Local Government Areas, CRS also works as a sub-grantee with the Global Fund in support of malaria prevention and treatment. With funding from the Global Alliance for Vaccines and Immunization, CRS provides intensive advocacy and program management training to the Association of Civil Society Organizations on Malaria Immunization and Nutrition. 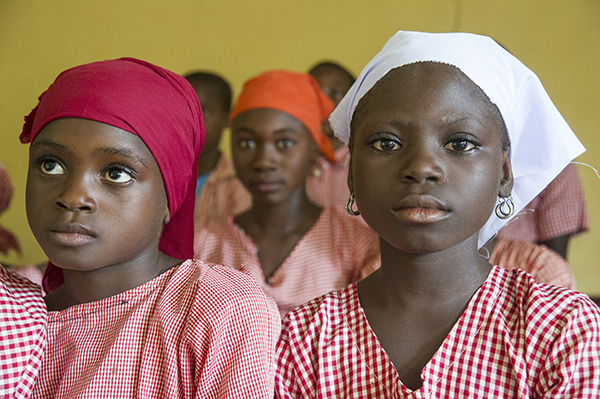 Currently, CRS in Nigeria hosts two global USAID-funded initiatives. CRS hosts the country secretariat of the Core Group Partners Project (CGPP) that supports Nigeria’s polio eradication and routine immunization strengthening efforts at the community level. CGPP focuses on five northern states in Nigeria where children under five are at high risk of contracting the polio virus. CRS also hosts the Coordinating Comprehensive Care for Children (4Children) Project, a consortium of six organizations led by CRS, designed to improve access to HIV-sensitive services for OVC and their households. In Nigeria, 4Children provides technical assistance to 16 President’s Emergency Plan for AIDS Relief (PEPFAR) OVC Implementing Partners and 33 state governments. CRS presently implements a multi-sectorial agriculture-led livelihoods project to empower very poor households. CRS supports households to increase their agriculture production and incomes, as well as improve comprehensive nutrition, water, sanitation, and hygiene education in response to livelihoods challenges faced by many farming households in Northwest Nigeria. Through funding from the Bill and Melinda Gates Foundation, CRS’ Strengthening Cassava Seed Systems and the follow-on BASICS program focus on helping farmers improve revenue and food supply with high quality certified cassava stems through a traceable value chain. At present, CRS’ cassava project is developing an economically sustainable and integrated cassava seed system characterized by the commercial production and sales of planting material that spans the seed value chain. CRS launched its emergency response in Yobe State in 2014, initially providing emergency WASH and malaria programming through private funds, then by a USAID Food for Peace-funded emergency food security program and an OFDA-funded WASH program. In 2016, CRS launched a multi-sectoral response to provide life-saving food, WASH, and shelter assistance as well as agricultural support to facilitate a return to livelihoods in Borno state. To maximize beneficiary choice and promote local market functioning, CRS utilizes an innovative, cash-based e-voucher system as part of markets-based programming. Through the Capacity for Inter-Religious Community Action, CRS focuses on a joint approach to deepening commitment to capacity strengthening and peacebuilding, particularly inter-religious engagement.